This Hindi book will help you learn the vocabulary you need to socialize with other young Hindi speakers and enjoy cultural attractions such as nightlife and Bollywood movies. 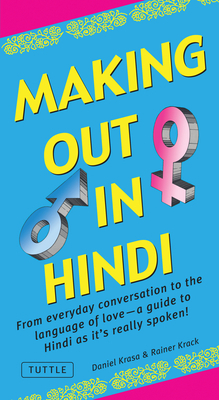 Making Out in Hindi is a fun, accessible guide to the contemporary Hindi language as it's spoken in real life. It's the perfect phrase book geared towards everyday interactions and includes current slang and street expressions not covered in other phrase books, accompanied by line art illustrations. Each expression is also shown in Hindi script to enhance your recognition of the language (and in a pinch, you can even show the book to the person you're speaking to). Making Out in Hindi also includes occasional references to Bollywood films, so even if your travels take you no further than your art-house cinema or your TV, this is the phrase book you will want to have. Daniel Krasa is a scholar of Middle Eastern and Indian languages and dialects and a longtime India aficionado. Since studying Northern Indian languages at several universities in India, Daniel has specialized in writing phrase and textbooks focused on travelers' needs. Rainer Krack is the author of numerous German language books and article on India, Nepal, Sri Lanka, Thailand, Malaysia and Singapore.